Fluke is a leading manufacturer of electronic tools and software. Fluke PAT testers are used for portable appliance testing to verify that the electrical safety and operation of the appliances meet the relevant regulations. Fluke PAT testers have powerful auto test capabilities and simplified controls, including 'one touch' test routines. Fluke also do lightweight all-in-one PAT testers, designed and built with the same rugged reliability as all other Fluke test and measurement instruments. These Fluke PAT testers are compact and will withstand the tough demands of working in the field. The Fluke PAT testing equipment provides a complete all-in-one solution, having features which are needed for testing portable appliances on-site. 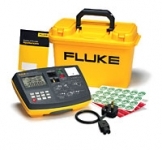 Fluke have a selection of both automatic and manual PAT testing equipment: the Fluke 6200 and the Fluke 6500. Both PAT testing systems perform all tests for class 1 and class 2 appliances and conform to safety standard EN61010. The Fluke 6200 is cost-effective and best used for manual testing and low volume applications. The Fluke 6500 is a more powerful portable appliance tester for checking a large number of appliances and has a wide range of pre-set tests, Compact Flash memory for storing and transferring test results and professional test models.